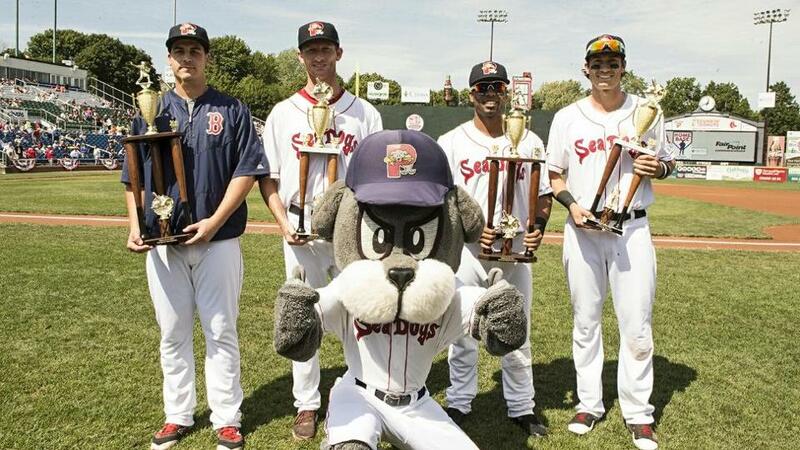 Portland, Maine - The Portland Sea Dogs, the Double-A affiliate of the Boston Red Sox, presented their annual team awards for the 2016 season prior to Sunday's final game of the season at Hadlock Field. The team awards are voted on by the fans and are handed out in four different categories: Most Valuable Player, Pitcher of the Year, 10th Player, and Citizen of the Year. With the exception of a five-game stint at Triple-A Pawtucket, Aneury Tavarez has spent the entire 2016 season with the Sea Dogs and served as a daily fixture in Carlos Febles' lineup. Tavarez has the chance to become the first Sea Dog to lead the league in average since Kevin Millar in 1997 (.342). Tavarez has already set a new Sea Dogs franchise record with 13 triples and currently leads in the team (among qualifiers) in average, on-base percentage, slugging percentage, hits, triples, total bases, stolen bases, and runs scored. In addition to leading the league in average, Tavarez also ranks among league leaders in triples (2nd), on-base percentage (3rd), and slugging percentage (4th). Tavarez was named to both the Eastern League mid-season and season-ending All-Star teams and went 1-for-3 with a double in the All-Star game in Akron. The 2016 season is Tavarez's second in Portland, last year he hit .226 (53-for-234) with 5 home runs, 14 RBI, 13 doubles, 1 triple, 25 runs scored, and 4 stolen bases in 67 games. The 24-year-old was signed by the Red Sox as an international free agent on October 10th, 2010. Keith Couch was added to the Sea Dogs rotation on May 7th and quickly established himself as a top-end starter, allowing just two earned runs over his first three starts (20.0 IP). Couch leads the Sea Dogs in wins, shutouts (tied), and ranks second in ERA (min. 60.0 IP). Couch worked three consecutive complete games from June 27th to July 7th, including back-to-back nine-inning complete games and a shutout in New Hampshire on July 7th. Couch has also vaulted himself into the all-time franchise leaders in several pitching categories. He set a new all-time record with seven career complete games and ranks second all-time among Sea Dogs pitchers in wins (28), 6th in winning percentage (.757), 7th in innings pitched (321.1), 8th in strikeouts (218), and 9th in games started (47), and A native of Elmont, NY, Couch was selected by the Red Sox in the 13th round of the 2010 June Draft out of Adelphi University. Court joined the Sea Dogs on May 3rd after being signed from the Sioux City Explorers in the independent American Association and had an immediate impact on the offense, recording a base hit in five of his first six games. The Elgin, IL, native hit over .300 for three consecutive months from May to July and recorded a 10-game hit streak from May 26-June 6 when he went 18-for-37 (.486) with a home run, 3 triples, 2 doubles, and 10 RBI. After an 18-game stint in Triple-A Pawtucket from late June to early July, Court returned to Portland on July 11th and has been with the Sea Dogs for the remainder of the season. A versatile defender, Court has seen action at third base (54 games), first base (11 games), second base (6 games), shortstop (5 games), and outfield (2 games), and has only committed six errors in 266 total chances, good for an overall fielding percentage of .977. Mike McCarthy has firmly established himself as a fixture in the greater Portland community since his arrival to the Sea Dogs in 2016. The 2016 season marked the third year that McCarthy helped organize and coordinate the Baseball Miracles equipment drive at Hadlock Field to help donate baseball equipment to children in impoverished areas. Throughout the season, McCarthy volunteered and helped organize community appearances all over the greater Portland area and was also a fixture at several Sea Dogs baseball clinics throughout the season. During the All-Star break, McCarthy helped organize a baseball camp for kids in the Bangor/Brewer area. In 9 games (4 starts) for Portland in 2016, McCarthy went 0-2 with a 5.28 ERA (17 ER/29.0 IP). This marks the third straight season McCarthy has been named Sea Dogs Citizen of the Year. The California native was selected by the Red Sox in the 14th round of the 2011 June Draft out of Cal State Bakersfield.